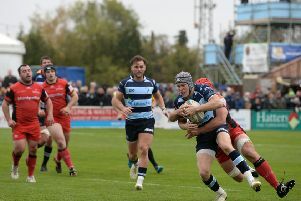 Bedford Blues winger Dean Adamson praised his team’s desire to come back and win the game after the Blues secured an important 54-46 victory over the Cornish Pirates. In-form Adamson ran in a hat-trick of tries against the Pirates to seal the victory for his side who found themselves 12-0 down within the first 10 minutes of the game. Bedford knew that a victory over the Pirates would extend their lead to eight points over their rivals for the play-off places, and Adamson said: “We can take many positives away from our attacking game but our defence still needs work going forward. “We attacked from all areas out there today and we scored a lot tries; we might have even left more out there on the field but we done enough to get the victory over a tough opposition. “The forwards worked really hard and they kept their structures and we played off that – they won the battle on the day with Bedford coming out victorious”. Adamson has displayed some fantastic running rugby at Goldington Road this season, but his three tries against the Pirates represent one of his finest performances in the 2015/16 Championship campaign. The 22-year-old winger has certainly cemented his place on the teamsheet week-in week-out for Mike Rayer’s men – and it’s no surprise with the winger in such impressive form. Adamson added: “We really need to work on our defence, we have two cup finals left this season. One against Doncaster away and one against Bristol at Goldington Road. “We’re looking forward to these games as a team. Bedford enjoy a week off this week but their Championship campaign resumes with an away trip to the Doncaster Knights on the April 16.